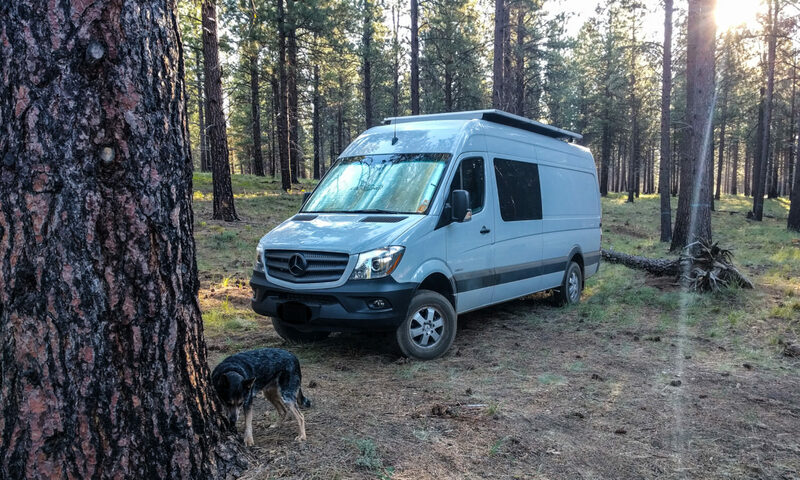 The spare wheel on a Sprinter van appears to be magically locked in the wheel carrier. You need to know a simple trick in order to release it. Here’s a picture of the spare wheel, held up under the rear of the van in a metal carrier cage. It really helps if you read the manual, because that explains how to get to the wheel. Of course, if you’re here, that means you probably didn’t read the manual. 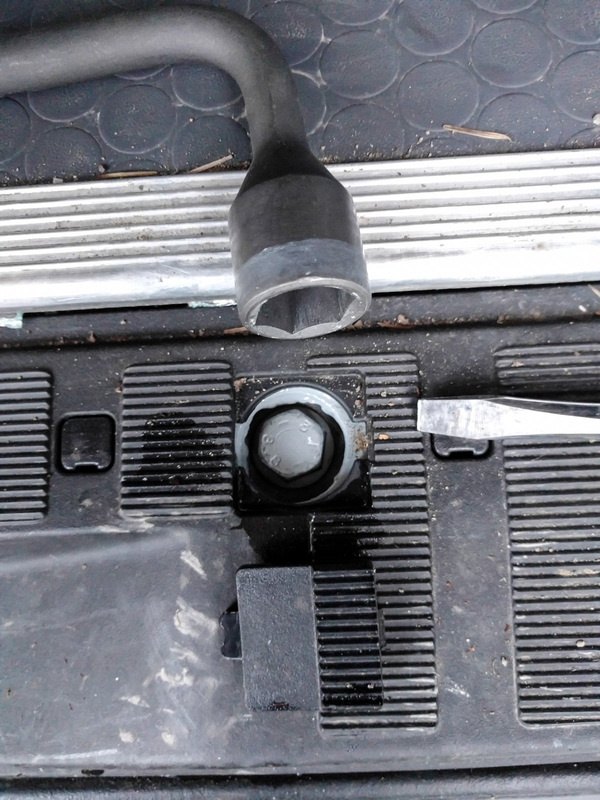 The trick (if you can call it that) is to lever up a couple of plastic covers in the part of the rear step that is hidden underneath the rear doors when they are closed. Once you have the covers out of the way, you’ll see a bolt underneath each one. The bolt is the same size as the wheel lug bolts. You can use the wheel lug wrench to loosen them off. What’s happening when you loosen them is that a hook on the other end of the bolt is being lowered down. 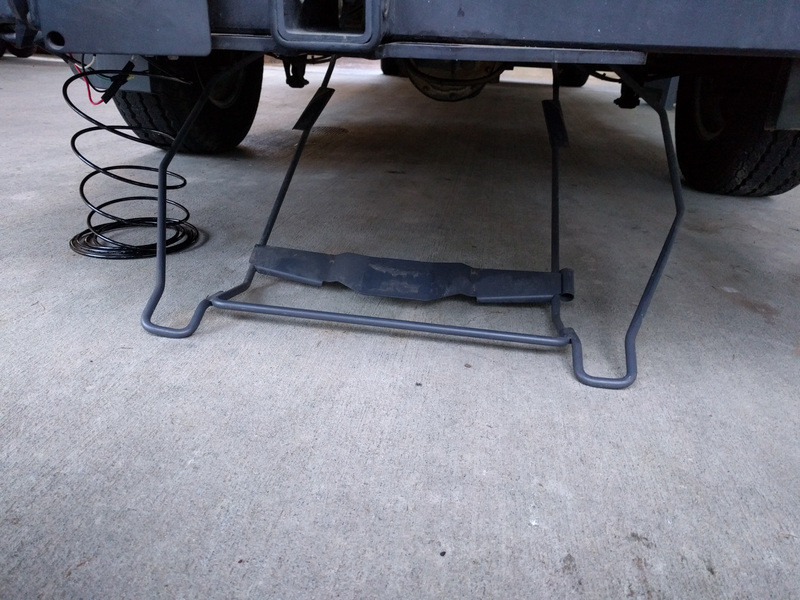 This hook holds the rear end of the spare wheel cage in place. 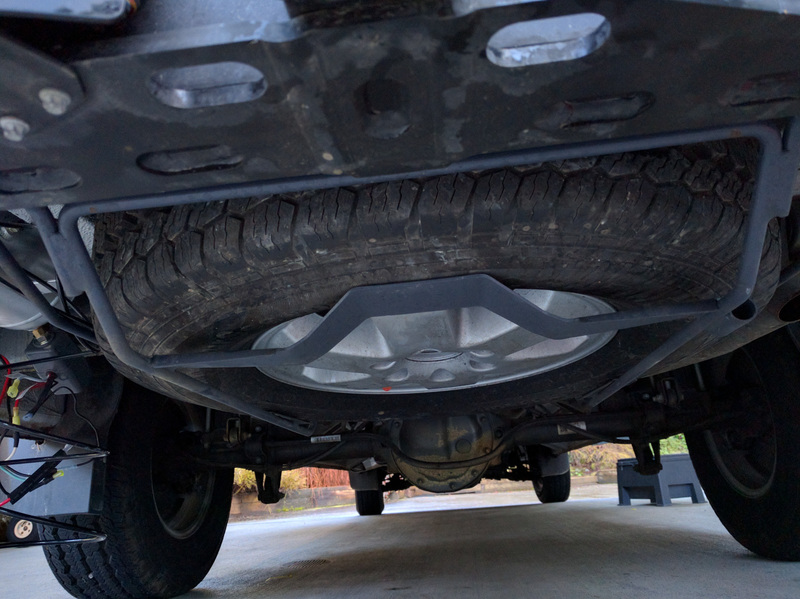 Here’s the hook from the back, looking underneath the bumper and above the rear hitch. In this picture the spare wheel cage is already unhooked from this hook. Here’s another view of the hook from underneath. 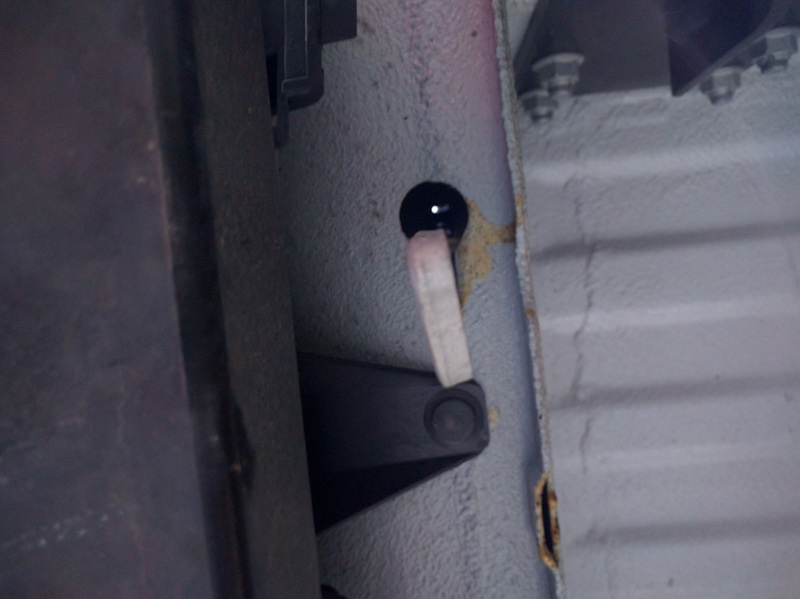 You can see the hole that goes up to the bolt that you unscrewed. You don’t have to completely undo the bolt until it pulls out. Just enough to lower the spare wheel cage. Then, you can lift the cage back up a little, pull the hook out of the way, and lower the cage down to the ground. It’s hinged at the end furthest away from you/closest to the front of the van. 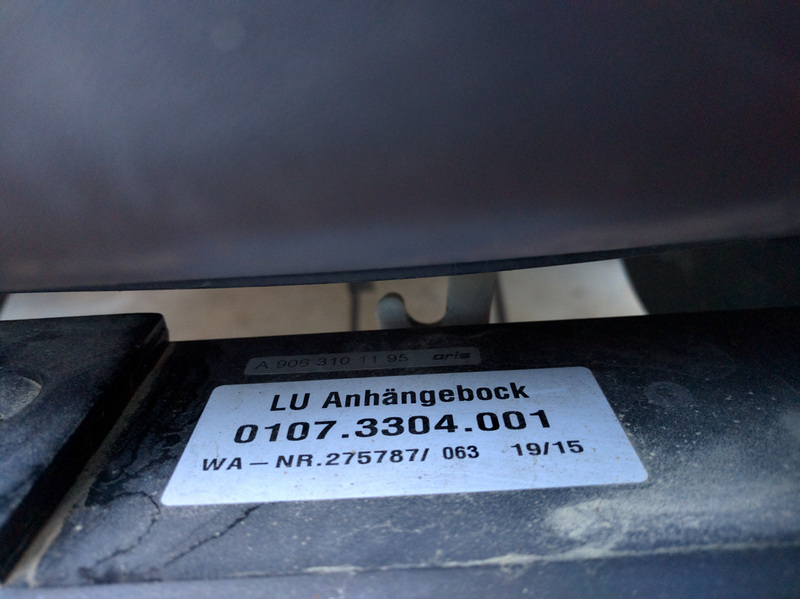 The manual suggests using the jack handle extensions hooked in to the edge of the spare wheel cage as a lever to help you lift it up a little to unhook the clip, then lower it down to the ground. At that point you can drag the wheel out from the holder. If you’re changing a flat, you’ll probably just throw the dead wheel in the back of the van. Don’t forget to hook the spare wheel cage back on to the two hooks and tighten them back up again before you drive off!